I left the recipe picking for the extended family birthday party for Carter & Sophie up to Kris, and I am actually pretty darn impressed with his recipe choice. The Blueberry Sour Cream Coffee Cake was taken from all recipes and it is a great recipe to serve to a large group of people. The best thing about all recipes is that you can change the serving sizes to increase or decrease. Beat in the eggs one at a time, then stir in the sour cream and vanilla. Combine the flour, baking powder, and salt; stir into the batter just until blended. Fold in blueberries. In a small bowl, stir together the brown sugar, cinnamon and pecans. Sprinkle half of this mixture over the batter in the pan. Spoon remaining batter over the top, and then sprinkle the remaining pecan mixture over. Use a knife or thin spatula to swirl the sugar layer into the cake. 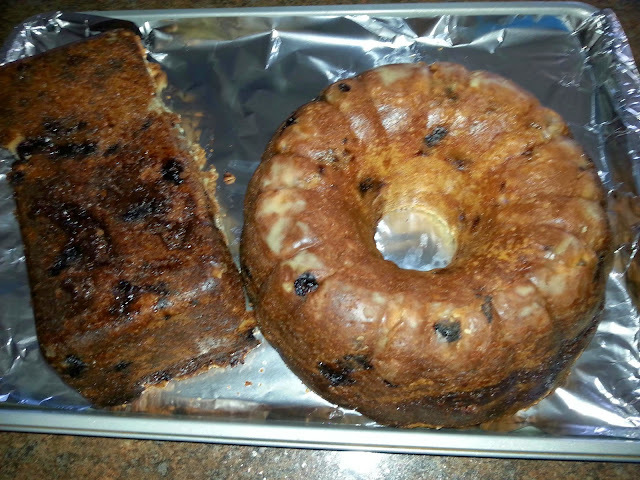 Bake for 55 to 60 minutes in the preheated oven, or until a knife inserted into the crown of the cake comes out clean. Cool in the pan over a wire rack. Invert onto a serving plate, and tap firmly to remove from the pan. Dust with confectioners’ sugar just before serving. There is absolutely nothing healthy about this coffee cake but it is SO good.